Whenever we hear the name Syria, all we can imagine is pictures of death and destruction. However, Syrian musicians, who fled their war-torn country and took refuge across Europe, have united under the Syrian Expat Philharmonic Orchestra to counteract these images and display a part of the Syrian and Arabic culture through music. A part that replaces death with beauty and destruction with hope. 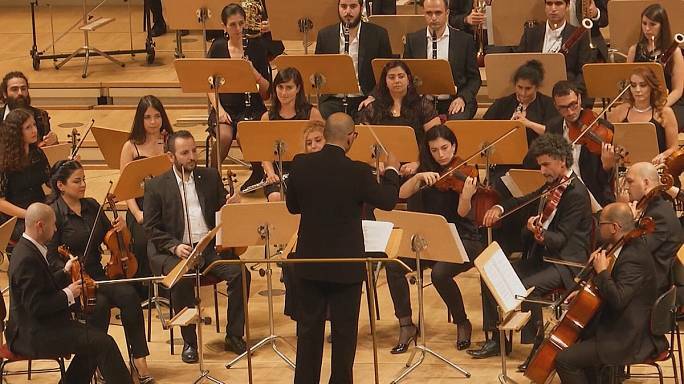 Raed Jazbeh, who came to Germany in 2013, founded the orchestra. For him, and the 65 Syrian musicians composing the orchestra, this is not only about performing, but about showing the European people the true Syrian culture and music. All the musicians are classically trained, and the majority of them studied music at the Higher Institute of Music in Damascus. – They are not amateurs, but professional musicians who hope to bring part of their culture and heritage over to Germany. The group has only performed in Germany, but they are planning to perform in Sweden soon, and all over Europe in the future.